(Nanowerk News) The exhaust system in your car and the plastic cup holding your drink, along with countless other products, rely upon reactions driven by catalysts supported on aluminum oxides. Characterizing these aluminum oxides or alumina has been challenging. For the first time, scientists at Pacific Northwest National Laboratory (PNNL) and FEI Company obtained an atomically resolved view of the alumina form known as delta alumina. 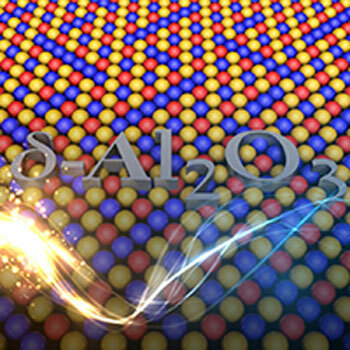 Using experiments and computational approaches, the team showed that the oxide is two crystal forms or variants woven together ("Structure of δ-Alumina: Toward the Atomic Level Understanding of Transition Alumina Phases"). "They interweave at the atomic level," said Dr. Libor Kovarik, PNNL scientist and lead author on the study. "The result is not a simple structure." "Using chemical imaging techniques in a clever way, we can solve old, important problems," said Dr. Janos Szanyi, who has extensively studied alumina supports to create improved catalysts. They began with a high-angle annular dark field electron microscope at a national scientific user facility in Washington State, known as EMSL. Sponsored by the U.S. Department of Energy's (DOE's) Office of Biological and Environmental Research, the facility contains a host of instruments, available for free when certain conditions are met. "Without the microscopy in EMSL, this work would not have been done," said Kovarik. "Their new microscopes are very powerful and can resolve the crystal structure at the atomic scale." The crystal structures of these transitional aluminas were also studied by X-ray diffraction, also available at EMSL. In addition, the team used EMSL's supercomputer (Cascade) to derive energetic stability using density functional theory calculations to get at the heart of the material's structure. The result was a clear picture of where the aluminum atoms were located in the oxygen framework. Specifically, they uncovered how delta alumina contains interwoven domains with different crystal arrangements or symmetries but with similar atomic bonding. This knowledge provides a foundation for designing better catalysts, which sit on the surface of transition aluminas. The researchers are continuing to characterize the structure and behavior of delta alumina and its related polymorph, gamma alumina. "The materials present a lot of questions," said Kovarik. "We are working to understand them, particularly the aluminum bonding on the catalysts surface."